Join the community in supporting those whose bowls are empty during this awareness and fundraising event for STEP, the local food shelf. 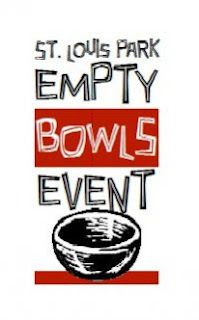 The Empty Bowls event is on Tuesday, March 4, at the St. Louis Park Recreation Center, 3700 Monterey Drive. Stop by for lunch between 11 a.m. – 2 p.m. or dinner between 4:30 – 7 p.m. At the event you will receive a simple meal of soup and bread donated by local eateries. Then choose from a wide array of handmade pottery bowls, many produced by area students, to take home as a reminder of hunger and all the “empty bowls” in our world. Finally you can make a donation to the STEP food shelf. Those 16 years and older who would like to volunteer at Empty Bowls should visit STEP’s facebook page.